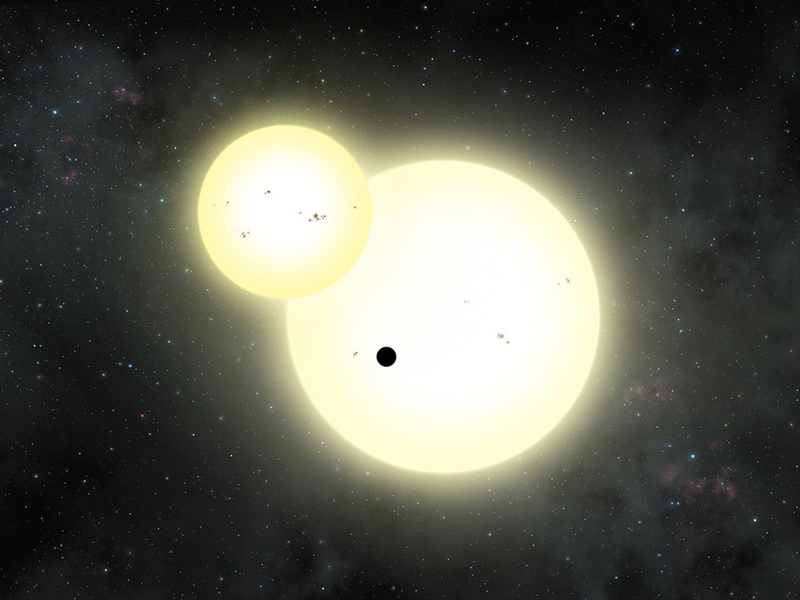 NASA’s Kepler space telescope has found a gas giant planet with two stars similar to our sun, surrounding it. The exoplanet has been named Kepler 1647 b, and it could be a planet to research for alien life. Researchers have confirmed this is the largest exoplanet discovered so far and its similarities to Jupiter by mass and radius. Kepler 1647 b is located in the Cygnus constellation at 3,700 light years, and it has been estimated to be 4.4 billion years old, being similar in age to Earth. The exoplanet has also been found near its star’s’ habitable zone, which means it has the amount range of distance between them and could have stable liquid water on a joint surface. Since the planet is a gas giant, a surface is not one of its characteristics, yet researchers have determined the moons surrounding the planet are perfectly capable of having liquid water or life in them. The newly found behemoth is what specialists call a circumbinary planet, which means it orbits around two stars instead of just one. This type of planets was first found in 1993 after five years of observation. Kepler 1647 b, is located at 2.7 astronomical units from both of its suns and was found by experts thanks to the amount of light its stars showed. This method is common to find distant exoplanets. Researchers study the amount of light a planet shows when passing from Earth’s perspective, what makes it harder to find circumbinary planets (CBP). “CBPs are harder to detect because their transits are not strictly periodic. A planet around a single star is like a clock, if you are outside the solar system and see Earth, you’ll see the transit every year. When a CBP transits, the consecutive events can be early or late by many days, they can even cease altogether,” Veselin Kostov a NASA researcher and lead author of a study yet-to-be published about the planet told the Washington Post. This CBP was hard to spot by researchers, having the first sign of the planet in 2011 but with one single transit, researchers were not able to study it and had to wait for years for another transit. Afterward, they kept a close look on the planet, to measure and analyze. “It is a bit curious that this big planet took so long to confirm since it is easier to find big planets than small ones. But it is because its orbital period is so long,” said co-author Jerome Orosz. Kepler 1647 b, was discovered thanks to NASA’s space telescope first launched in 2009. Having as a first mission the identification of planets similar to Earth to the Milky Way to seek for possible life signs. The findings were announced at today’s 228th meeting of the American Astronomical Society located in San Diego, California. Gay and bisexual men still barred from donating blood in the U.S.